The Dawn space probe did not respond to a planned communication attempt on October 31st. NASA concluded that Dawn has exhausted the hydrazine reserves of its micro-propellants. The space probe is therefore unable to point its communication antennas in the right direction or to keep its solar panels in the direction of the sun. The Dawn mission has been incredibly long and fruitful. It was launched in 2007 to study the two largest objects in the asteroid belt, Vesta and Ceres. 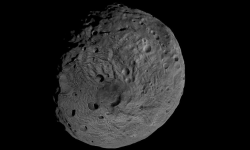 It spent fourteen months in Vesta’s orbit and more than three years in Ceres’ orbit. The Dawn space probe has provided valuable information on the celestial bodies of the asteroid belt and on the only dwarf planet in it, Ceres. Even though Vesta and Ceres are located in the same region of the solar system, they are very different celestial bodies. Vesta is almost entirely made up of rocks while Ceres is much richer in ice. 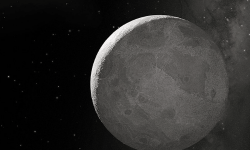 It is even possible that the dwarf planet still has an ocean below its surface. Thanks to its richness in water ice and organic compounds, Ceres could contain valuable clues about how life appeared in the solar system, which may justify the launch of a new exploration mission to the dwarf planet. In the meantime, Dawn’s orbit should remain stable for a few more decades. All the dwarf planets are beyond the Kuiper belt, on the edge of the solar system. But there is one exception, it is the dwarf planet Ceres which is in the main belt of asteroids located between the orbits of Mars and Jupiter. Since it is much closer, it is also easier to explore. This mission has been entrusted to the Dawn space probe since March 2015. Initially, the spacecraft had placed in orbit more than 13000 kilometers from its target. But for three years, NASA is gradually bringing its probe closer to the surface of Ceres. On June 6, the Dawn spacecraft performed a maneuver to once again lower its orbit, which is very elliptical. It travels up to 4000 kilometers height from the dwarf planet at its highest point, but is only 35 kilometers above the surface at its lowest point. This proximity should allow the space probe to make new observations and therefore new discoveries. The orbit has been studied to regularly fly over a particular point of Ceres, a crater called Occator. It intrigues a lot because it is covered with clear tasks that are difficult to identify. According to Dawn spectrometer analyzes, it is a species of brine composed largely of sodium carbonate. The origin of these compounds, and the fact that they are dispersed into tasks, are complicated to understand. We can not identify the causes of their existence. This may be a local phenomenon or a phenomenon brought from outside by comets for example. For the Dawn space probe, which is completing its eleventh year of mission, these observations are very delicate because the reaction wheels that allowed the space probe to orient broke down. It can therefore only use its micro-propulsion to orient itself. As it flies over Ceres at a very high speed and the Occator crater is only 92 kilometers in diameter, it only takes a few seconds of inaccuracy to miss the picture. NASA will have to calibrate each pass very precisely to exploit this new orbit. The observations of the Dawn space probe continue in any case to fuel the research of planetologists. This month, a team from the University Brown published an article in which it asserts that dwarf planet tasks are much richer in organic compounds than originally imagined. The mystery of Ceres is therefore thickening. It is difficult to explain the presence of these tasks that are found only in the northern hemisphere of the dwarf planet. The Dawn space probe launched in 2007 is currently in orbit around Ceres. Arrived at the end of life, its mission has already been extended once. But in theory, it must end on June 30th. Nasa has not yet communicated on what it wants to do with its probe. It still has a little fuel but its navigation tools are very damaged. Nasa has the choice between turning off the Dawn probe, continuing to study Ceres, or trying to join a new asteroid. Dawn has already largely fulfilled its goals. The space probe has successively orbited around the two largest objects in the asteroid belt between Mars and Jupiter : the Vesta and Ceres planetoids. Like many of Nasa’s most recent probes, Dawn is equipped with an ion engine powered by solar panels that offer a very small boost, a few tens of millinewtons. But it consumes only 300 g of fuel every 24 hours. Ionic engines are therefore able to operate for very very long periods. 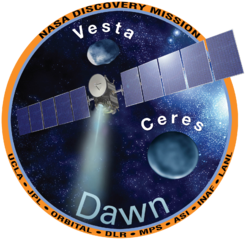 The launch of the Dawn spacecraft around Vesta and Ceres was carried out in 2011 and 2015. Each time, Dawn received a little more than a year to study each of the celestial bodies. The scientific results of the mission can be considered a success : we have learned a lot about Vesta and Ceres. The space probe was able to map the two planetoids very precisely and to determine their composition. Vesta has two huge impact craters 400 and 500 kilometers in diameter, which testifies to the restless past of the asteroid belt. 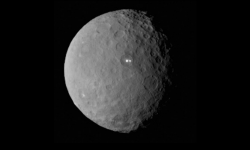 But Ceres is certainly the most interesting of the two planetoids. The scientists of the mission are indeed convinced that the planetoid has hosted one or more liquid oceans in the relatively recent past. The strong presence of carbonate identified by the Dawn probe indicates that an important hydrothermal activity took place on the surface of Ceres. In other words, the small planetoid of the asteroid belt was once a spa.